The 2011 edition of the Omloop Het Nieuwsblad (formerly Het Volk) will centre around three crossings of a 2km section of cobblestones, according to Het Nieuwsblad, its sponsoring newspaper. The race will also see its number of climbs reduced from twelve to nine, with the legendary Muur van Geraardsbergen dropped from the 200km race. Once again the course has been designed by retired Flemish classics legend Peter Van Petegem, who won the race three times under its previous name. De Peet also won the Ronde van Vlaanderen twice and Paris-Roubaix once, so he knows a little about races over hills and cobbles. A major change to the race will see the omission of some of the hills that feature in so many of the classic races in the area. The Berendries, as with the Ronde, will be missed due to roadworks, but the Omloop is also opting to miss out the Muur. 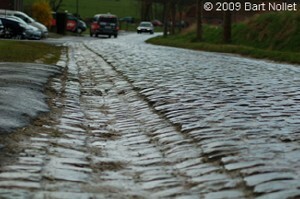 Much of this is due to the early position of the race in the calendar, but the legendary cobbled climb generally only features symbolically in the race anyway as it comes almost exactly at its mid-point. Even as the crow flies it is almost 40km from Geraardsbergen to the finish city of Gent, so the race will use the climbs around Oudenaarde and the cobblestones of the region to force a selection. "We opted for Van Petegem’s trilogy of cobblestones of the Haaghoek, the Leberg and the Molenberg as an intro for the relatively flat finale with the same areas of 'bad' stones as last year,” explained Van Herreweghe. “We tried to make a very balanced course, taking into account the fact that this course will be held on Saturday, February 26 and not in April when the peloton is already up to speed. The Omloop traditionally opens the season in Flanders, and is followed by Kuurne-Brussel-Kuurne the next day. Situated as it is, traditionally on the last weekend of February, it often falls prey to the late winter weather with the 1986 and 2004 editions having to be cancelled due to heavy snow. In common with the Ronde and Flèche Wallonne there has been a women’s edition of the race held on the same day; the 2010 edition was won by Swedish champion Emma Johansson (RedSun).